DB2 for z/OS takes advantage of data sharing technology in a z Parallel Sysplex to provide applications with full concurrent read and write access to shared DB2 data. Data sharing allows users on multiple DB2 subsystems, members of a data sharing group, to share a single copy of the DB2 catalog, directory, and user data sets. Data sharing provides improvements to availability and capacity without impacting existing applications. The road to data sharing might seem arduous to a novice user, but once you have started to learn terminology and gain basic understanding, things will become much easier. 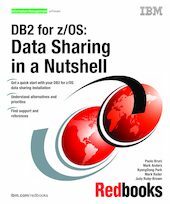 This IBM Redbooks publication is meant to facilitate your journey towards data sharing by providing a cookbook approach to the main tasks in enabling data sharing and workload balancing. It does not have all the answers, because it is a brief summary of a large field of knowledge, but it contains the key elements and it points you in the right direction to get more details. Throughout this document we assume that your sysplex environment is set up and a DB2 subsystem exists at a currently supported level.